Tecsound T50 and self-adhesive T50s non-flammable sound barrier mats will reduce noise through timber floors by adding at least two layers increasing the mass. The more mass there is applied the better the soundproofing becomes. 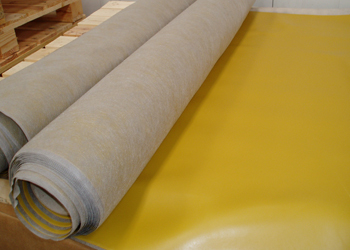 Tecsound is a non-flammable, high performing soundproofing mat and can be used to upgrade the soundproofing of timber joisted floors by adding layers to increase the mass and is supplied in rolls. Recyclable and made using 68% recycled mineral fillers Tecsound T50 and the self-adhesive T50S are the new non-flammable soundproofing mats designed to easily upgrade the soundproofing of timber joisted floors in domestic properties. It works very well when installed onto the top of timber floor boards and the more layers that are applied the better the soundproofing becomes. The product can be loose laid or for a more permanent fixing, use the self-adhesive T50S. Tecsound soundproofing mats are a polymer-based, asphalt-free, high density synthetic sound barrier product that offers good soundproofing performance. The product is very visco-elastic as temperature tolerant unlike our SBM5 and SoundBlocker Membrane, does not contain PVC’s. (Above) Test result of T50 hung as a curtain T50 and T50S are heavy products and help will be required when handling the rolls! Because a large percentage of recycled materials are used in the production of this product, a smell may sometimes be evident. Although the smell is non-hazardous, if an odour is present, it is advised the product has a thin polythene layer placed over it to contain the smell before fitting anything on top. Polythene can also be purchased at the same time as the product if preferred and is sold be the linear metre off rolls 4m wide.